This is an amazing set of 115 original Art Deco handmade tiles by S.A. Faienceries de Bouffioulx, 1930s. A beautiful relief and color. With a stylish design. 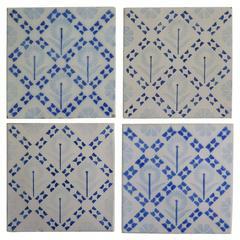 These tiles would be charming displayed on easels, framed or incorporated into a custom tile design. Please notice that the price is for the hole set. Size each tile: 5.8 inches (14.7 cm) width x 5.8 inches (14.7 cm) height x 0.39 inches (1 cm) thick, size of the panel 39.4 inches (100 cm) width x 30.11 45,1 inches (114.7 cm) height x 0.39 inches (1 cm) thick. 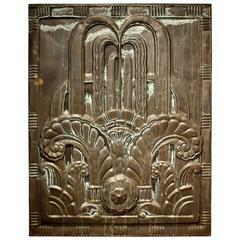 We offer also around boarder tiles that would go well with the panel. Condition is generally very good. Minor chips, scuffs and wear associated with age. Some crazing to the glaze is part of the design. There can be slight variations in each tile's size because of there age and craftsmanship. 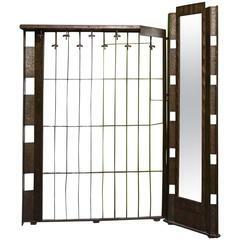 Hall Mirror Coat Hanger wrought iron Art Deco 1930's. 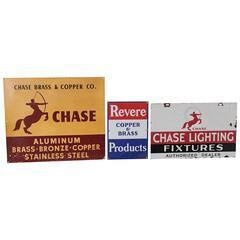 Chase Brass and Copper Company, Revere Copper and Brass Inc.